Hmmm. Last we heard, the official story about the collapse of Lehman Brothers blamed it on pesky legalities: Barclays was ready to do a deal to acquire Lehman at the last minute, but only if they got government backstopping as part of the acquisition. Treasury, however, didn’t have the legal authority to provide any guarantees, so there was no acquisition and Lehman went into bankruptcy. Now, this story has always seemed a little fishy, partly because it’s changed a bit from time to time, and partly because Treasury had already provided support for the rescue of Bear Stearns, Fannie Mae, and Freddie Mac, and would provide support for AIG just a few days later. So if they had the legal authority for that, why not Lehman? 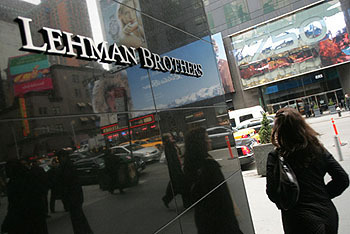 ….The UK tripartite authorities — the FSA, the Bank of England and the Treasury — had expected the US government to stand behind Lehman in the way that it had backed two crucial mortgage lenders the previous week and helped to orchestrate the bailout for Bear Stearns in March. If the UK authorities were expecting the Americans to bail out Lehman, that means the Americans never brought up any legal hurdles. And they surely would have mentioned it if that’s what was really standing in the way of a deal. Right? So what’s the real reason?